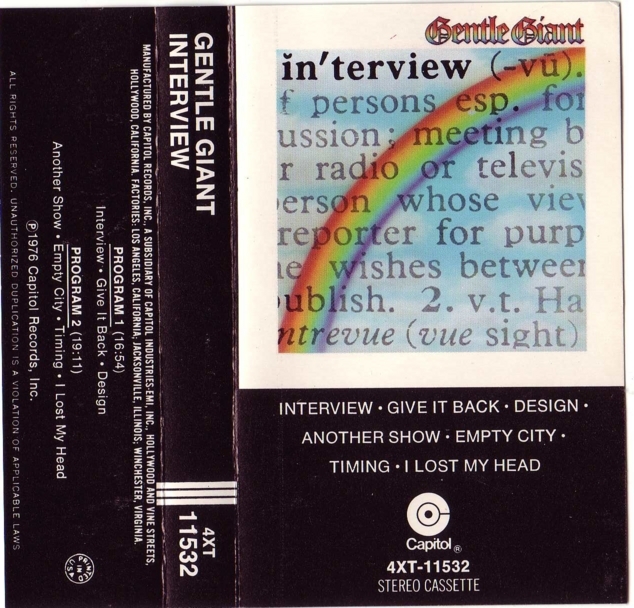 ♣ “In’terview”, Gentle Giant’s second album for Chrysalis was released in April 1976, and as the title suggests, is loosely a concept album based upon a series of interview questions posed to the band by journalist Phil Sutcliffe. This special edition (CD/DVD) features a previously unreleased lost quadraphonic mix. The special 4.1 Surround Sound mix (for you audiophiles it’s DTS 96/24 and Dolby Digital 48kHz/24bit) has been adapted from those original Quad mixes. The release also includes newly commissioned sleeve notes written by the band themselves. • Interview, from 1976, was the follow–up to Gentle Giant’s most successful album to date, Free Hand. • Possessing a darker, more Rock orientated edge than anything the band had done up to this point, the album was seen as an equally brilliant, but less optimistic response to its celebrated predecessor. • Arguably the band’s last classic album. • A re–mastered cd version, the booklet contains sleeve notes from the band members. • A concept album, structured as a phony interview. The music contains numerous criticisms of the music industry and the silly questions that rock stars get asked repeatedly. Recorded at: Advision Studios, London., February/March 1976. • All lyrics reproduced with the permission of DRT Entertainment (USA) and Alucard Publishing, Ltd. (UK). — submitted by David Wilhite. Interview excerpts decyphered by Paul Moore. (The interview, part 1) Voice 1: Right....Now...Gentle Giant. Interviewer: Err. Gentle Giant, is it? Voice 2: Send for some coffee, Paul, will you? Interviewer: And who are you? Interviewer: Oh, you're related, are you? I didn't know about that. Interviewer: Er, where...where...where shall we begin, then? and we're together even now. Why do you ask? Surely you know it! Isn’t it clear just when and how. finding our road, the same as if today. not to not say, we like a lot. Don't take us something that we’re not. so all in all we feel we are alright. rather have none and do we think what’s right. What are your plans for the future now? And can you say who does the writing then? How did you get — who gave the name of the band? wait for the new man to arrive. saying our piece, though not alive. ♠ Gentle Giant also wants to thank our friends in radio for support, especially WLVR’s Jon who does the show Ear Responsible, WZBC’s Tom Gagliardi, and NPR’s Echoes with John Diliberto. This poster (and a few others) will be autographed by the band and made available for charity. ♠ The Gentle Giant catalog has just been reissued digitally this week on iTunes and other digital outlets. It will become available for the first time on re–mastered CD, along with a DVD of previously unreleased live footage in early 2009. The following interview with Derek Shulman offers up his recollections and reflections on the bands music and his career. ♠ Gentle Giant was never one of the archetypal Anglo prog groups who traded in pomp and circumstance. They were an eclectic band, made up of mates with different musical tendencies who came together to make music that explored their own collective ideas in search of a group style and sound. ♠ As chance would have it this happened in a time when the world seemed freer, a more open and magical place and the music being made served as a special soundtrack to so many peoples lives. Derek’s insightful answers clearly illustrate just why the band and its music were special, as well as the truism that while it’s great to look back and appreciate all you have done, the trick is to never forget that you should live in the here now and make the best of what you’ve got today.